1: Every year, we all tell ourselves not to read too much into miniscule sample results, and every year we end up talking about them because they seem like a better thing to talk about than “attitude changes” or the “feel of the clubhouse.” Those aren’t scare quotes; those numinous qualities may have more relevance to the 2014 team than Roenis Elias’ fastball velocity, but I have access to one and not the other. The M’s have played a handful of games, and most all of the encouraging signs from last spring are still present and still tantalizing. 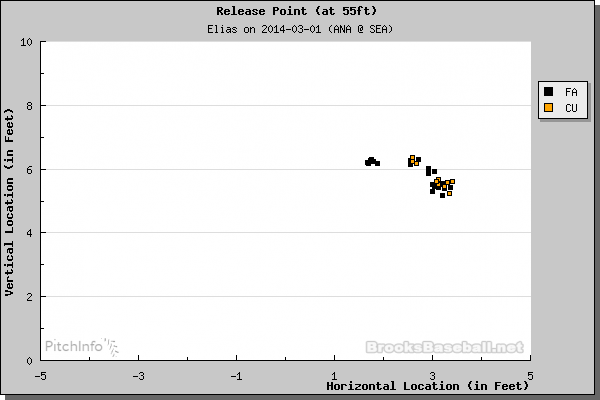 Dustin Ackley and Justin Smoak have driven the ball, and Logan Morrison seems to be tracking the ball well. Of course, Smoak had a slugging percentage of nearly .800 last spring, so this all looks awfully familiar. That said, the pitch fx system always provides a bit of problematic-yet-objective information from M’s home games in Spring Training, so what have we seen so far? First, Scott Baker’s outing yesterday gave a little something for everyone. For the optimists, he averaged just shy of 90mph with his fastball, up from 88+ is his brief stint last year, and just about 1mph lower than his average from his last healthy season, in 2011. Most pitchers tend to throw about 1mph slower than the regular season in ST, so if that holds true, his arm strength looks solid – better than it did in 2013, anyway. For the pessimists, he went two innings, and couldn’t sustain that velocity. He averaged 90+ in the first inning, then trailed off to 88 in the second. Something to watch this month. James Paxton was neither the 96-97mph fireballer that wowed M’s fans in September, nor the 89-91 walking “setback” that showed up in camp last year. He sat in the low 90s, which got analytical twitter’s attention, but everything depends on what you compare that to. Compare it to September, and it looks like he’s hours from injury. Compare it to last spring training, and it’s a bit encouraging. For the optimists though, it’s not enough to be “ahead of last year’s pace.” Last year’s pace saw him ineffective and inconsistent for most of the summer. Still nice to see him get grounders despite of the natural vertical movement on his fastball seemingly tailor-made for Phil Hughes-level rates. Carson Smith struck out the side and again showed off his video-game-like horizontal movement. The side-arming righty lives on a 93-mph sinker that shows crazy arm-side run, and a big slider. For a big league equivalent, I think Steve Cishek of the Marlins looks similar, and like Cishek, Smith may run sizable platoon splits. That’s fine so long as he keeps the ball on the ground (and given his sink and arm angle, I’m not clear how anyone hits a fly ball off him) and destroys righties. Dominic Leone was a big pop-up prospect last year, and rode a solid 2013 campaign to the Arizona Fall League. He relieved Smith and again flashed high 90s heat that comes, rather incongruously, from a sub-6′ righty. He hit 97 in his inning, after averaging 95 in the AFL. Maybe it’s his height/extension, but he gets fewer whiffs than you might expect. After not recording a swinging strike the other day, I looked up his (SSS alert!) AA stats at Statcorner. Not sure why the guy sitting in the mid-90s has one of the highest contact rates on the staff, but there you go. It’s not an obvious kiss of death – fellow fire-baller Bobby Parnell of the Mets has done this for years and still been effective, but the fact that minor leaguers are able to make so much contact makes you wonder why. 2: Saying that spring training games were upstaged sounds like I’m damning with faint praise, but this news requires the *loudest* of praise. MLBAM announced that they’re collaborating with Trackman and the Hego group to create a new ball/player tracking system that could revolutionize how we measure defense, baserunning and batted balls. That sounds less like loud praise and more like marketing bluster, I know. But read Dave’s post at Fangraphs here, and please, please, watch the video Dave’s kindly embedded. This is like the much-talked about field fx system, on steroids. Not only are batted balls mapped out from launch angle and velocity, but each player is measured multiple times per second. This means that fielders can be judged on essentially every aspect of their work – reaction time, running speed, and, crucially, route running. * The system will be in place this season at three ballparks (Target Field, Miller Park, Citi Field for now, everywhere else for 2015). So….are we going to get to see any of it? This is the big question, and MLBAM’s saying all the right things at this point. It certainly would make broadcasts cooler; the nature of a baseball broadcast is such that there’s often not a camera angle that can capture where fielders are positioned when a batter makes contact. Other observers are sure that teams won’t let this information flow to basement-dwelling bloggers. And given the sheer magnitude of the data, it’s not clear that the general public would have the resources needed to properly analyze/make sense of it. That said, this is pretty exciting. I’d given up hope that field fx would ever come out, and I’d really REALLY given up hope that it might be public. ** Nothing’s set in stone, but this announcement made my weekend. * My only lament is that it’s come a bit too late to measure a healthy Franklin Gutierrez. ** I’m going to leave the tea-leaf reading to others, but it looks like pitch fx may be on the way out, with MLB saying its status was “TBD” for 2015 and beyond. May not be a need for it if MLBAM broadcasts shift to the new system, though this means there’s a solid chance that the general public gets *less* information next year than this year. It’s the greatest analytical tool yet devised and will produce a huge amount of data that will absorb big bandwidth batches that MLB will need to deal with to make it public. They, the developers and producers will need to be paid unless MLB does it all, does it conjunction with broadcasters or teams or charges for independent users to use it. Making it public though will enable independent analysts to find uses for it that would not otherwise be developed. I really wish this was going to be implemented in Angel Stadium. It would be a lot of fun to watch Raul’s … well pretty much everything while he’s on defense. I wonder if the computer behind the system would start to spark and smoke (a la any number of Star Trek episodes, after the humans outwitted it and it couldn’t handle the input). Sabermetrics, instant replay, New Data Stream, welcome to the New Age Baseball – or not. These are new horizions and Baseball is merging into the future which has now begun. Good bye 1967 Pontiac Goat (GTO).